It’s important to remember that in order to effectively study, you need to take a few breaks in-between those long Sundays in Memorial Library. Tip #1: The first, and (most important, in my opinion) tip: TAKE BREAKS! Some of my favorite break ideas include taking a walk down lakeshore path, getting some Starbucks, or a quick workout. It is unproductive to study nonstop for 12 hours straight… your body needs a break! Get the juices flowin’ with keeping your body moving every now and then. 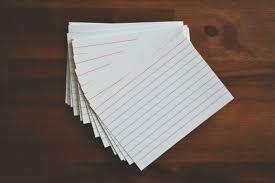 My freshman year, I started off using paper notecards. However, in college, you have a lot more material to cover than you did in high school. I found it faster to use an online flashcard outlet, Quizlet. This allowed me not only to make flashcards in a faster amount of time, but Quizlet also offers other various testing features. Try Quizlet instead of paper flashcards to speed up the process. CC Image Courtesy of PxHere. Tip #3: Early 2000s playlist. Trust me. If you’re going to be studying for awhile, you’re going to need a good playlist to jam to while working through those chapters. After finding early 2000s playlists, my days of studying have changed for the better. There’s nothing like some old Beyonce, Backstreet Boys, and Britney Spears to get you to pass your Biology exam. Truly a lifesaver. Everyone studies differently, but with these three general tips, your days of college studying are off to a good start. With short breaks, Quizlet, and some 2000s music, you’ll be on the path to studying success.